The NEAT glass, not Neat, NEAT. Got it? Naturally Engineered Aroma Technology. I guess N.E.A.T. isn’t as punny. Thanks to the kind folks at Big Earl’s Beverage Co. in Nicholasville, I had the chance to try this glass side by side with my trusty Glencairn. My first formal introduction to the glass was when I was forwarded an e-mail that came when Big Earl’s placed an order. Herein were detailed instructions on how to open the package that the glass comes in once you get it. Ok, really? Does this thing come in some sort of hermetically sealed Otterbox with booby traps? No, turns out it comes in a tube that most toddlers could figure out if they’ve ever ordered anything from Amazon (I hate clamshell packaging). Pour bourbon into glass, however much you want, it probably doesn’t matter, just not all the way full, because no one likes spilled bourbon. Add water if you want. Or not, I’m not your mother. Hold glass however it fits your hand. I have no idea if your hands are ‘too warm’ or not, so hold it with caution. On second thought do you have a straw just in case? Smell the bourbon, probably somewhere near the glass. Maybe close your mouth if you’ve been sitting around with it agape for the last 10 minutes. See if you like the way it smells. The bourbon, not your mouth. Where some people will tell you to swallow without having drank anything (see above), we suggest you put some bourbon in your mouth in order to taste it. Contemplate this picture of the creators of the NEAT glass while you sip, and watch out for the guy on the right, he looks shifty. Yes this is actually a picture from their website and not just a young Einstein. Look at all this science! Do you see how high their glass is on the WOW! scale. That’s like maximum wow! And look at that WordArt, so professional! At this point I would like to point out the careful verbiage used throughout the site which states studies were conducted “at UNLV laboratories”. It never says anything was “performed by” or “tested by UNLV scientists”. There are no references or actual study results given anywhere on their site, but they took the glass to a lab so it’s totally legit. Also, the site clearly states that the glass’ shape was created by “an accident in a glass blowing class in 2003″. Very scientific. OK, so, now having detailed instructions on how to open the package, how to use the glass, and being armed with the knowledge that I have been drinking incorrectly for years, I was ready to taste. For this comparison we used Old Forester 1870 and Larceny, in case you want to play along at home. In nosing the two glasses, I definitely did get more alcohol from the Glencairn. The ethanol smell I’m used to was, in fact, nearly completely missing once I got my nose in the “sweet spot” of the NEAT glass. Kudos to that, the accident worked. However, once I completed my second customary step of nosing in a Glencairn, which is to either let it sit a minute or gently blow into the glass to get rid of some of the ethanol, the difference was much less striking. Though definitely there, to be clear. As far as tasting, I noticed little to no difference between the two glasses. 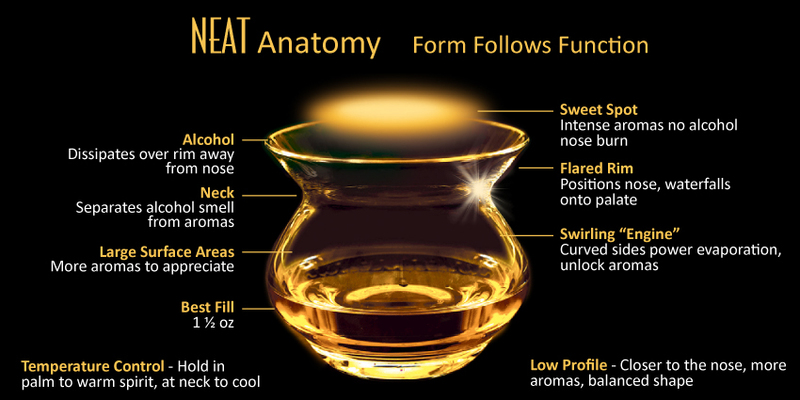 I will say that on the Old Forester 1870 I was able to pick up some different notes on the nose from the NEAT glass (mainly a nice honey scent) that I didn’t get in the Glencairn that made me enjoy the subsequent sips more from both glasses. And to be honest, I did really enjoy drinking out of a comical spittoon shaped glass that requires you to put your head directly over it to get the “sweet spot”. But I like looking ridiculous, maybe you don’t. So, the verdict? If you either frequently notice you’re smelling too much alcohol on the noses of your bourbons and don’t enjoy it, or just want to experience some of your favorites in a new way, I’d say give it a shot. It makes a great talking point and entertained me for a solid hour. I don’t think I will be buying one for myself, but would consider it for a tasting party. It does what it says, and I’m all for innovation. However, I did feel obligated to spend a great deal of this post pointing out the ridiculousness of their marketing and ‘science’. You’re not foolin’ us NEAT. Now go get your infrared thermometers, spend the next 30 minutes reading about how you’re supposed to drink bourbon, then heat it up to 900F and enjoy! Cheers! 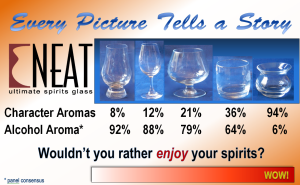 The NEAT glass can be purchased here for $14.95. Or you can get two of them in a velvet lined lunchbox for $94.99, what a deal! Next Post Better Ice: A New Hope, or Nope? Thank you for a sensible review and pointing out the idiocies of the marketing of this thing.